Niagara Falls, Canada is a pleasant city on the edge of the Niagara Gorge, at the site of the famous Niagara Falls. The city itself can best be described as quirky, with a carnival atmosphere showcasing all kinds of amusements, but its strategic location has made it one of the top tourist centers in Canada. The falls are easily reached by just a short walk along the main street that runs down Clifton Hill leading to the gorge. Three bridges link the city of Niagara Falls with its American counterpart, all of them with fine views into the gorge that divides the two. Niagara Falls are some of the largest, most beautiful, and most famous waterfalls in the world. There are three parts to the falls, but the two main sections are the concave Horseshoe Falls, 640 meters across running from the Canadian shore to the American shore, and the American Falls, about 330 meters across, in the State of New York. There is also a small third section located between these two, known as Bridal Veil Falls. On the Canadian side of the falls, a walkway stretches from above the falls all the way along the edge of the gorge, providing spectacular views. At night, the falls are lit up in different colors. Visitors can stand along a railing close to where the water tumbles 57 meters over the edge into the gorge. Just behind the viewing area is the Table Rock Welcome Centre with a restaurant overlooking the falls, shops, and an information and ticket booth where visitors can purchase tickets to the various attractions and tours. Below the falls, the Niagara River flows through the deep walls of the gorge, between 80 meters and 300 meters across, forming the Whirlpool Rapids as the gorge narrows. The waters eventually flow into Lake Ontario. Journey Behind the Falls offers a close up view of the falls from the base of Horseshoe Falls. From the Table Rock Welcome Centre, an elevator takes visitors down 45 meters to tunnels with viewing portals behind the falls and an observation deck near the lower edge of the falls. From here, visitors can look up at the wall of water coming over Horseshoe Falls and feel the rush of mist on their faces. This view offers a unique perspective and a completely different experience than viewing the falls from above. At a height of more than 235 meters above the falls, the Skylon Tower offers a spectacular bird's eye view of Niagara Falls, the Niagara Escarpment, and the city. The tower features an indoor/outdoor observation area and two restaurants. The Revolving Dining Room is an upscale revolving restaurant, while the Summit Suite Buffet is a more mid-range family oriented establishment. Access to the observation decks is free for those who are dining at the tower. Hornblower Cruises take visitors on close up tours to the base of all three falls in 700-passenger catamaran boats. There are different tour options, but cruises run all day and into the evening. This is a wet experience, and rain jackets are provided. Since the Maid of the Mist stopped operating out of Canada, this is the only boat tour option from the Canadian side that takes visitors to the base of the falls. The Whirlpool Aero Car is an antique cable car in continuous operation since 1916 suspended above the roiling waters of the Whirlpool Rapids. Visitors can take a ten-minute trip over this portion of the Niagara River for a unique view of the powerful currents swirling around in a massive whirlpool below. The Niagara Aero Car travels approximately one kilometer from one side of the gorge to the other and can hold 35 standing people per trip. The Niagara Parkway is a scenic drive running from Niagara-on-the-Lake, past Niagara Falls to Fort Erie, following the gorge. The road, lined by parks and green space, has many interesting sights along the way where visitors can stop. Some of the most popular features along the parkway are the Floral Clock, Whirlpool Rapids, and the Butterfly Conservatory. A paved pathway for walking and biking runs alongside the Niagara Parkway. The Butterfly Conservatory, along the Niagara Parkway, is home to 2,000 free-flying butterflies. The glass-enclosed conservatory with waterfalls and tropical plants features more than 40 different species of butterflies. This attraction is open year round making it particularly popular during the winter months when the outside gardens are not in bloom. Whirlpool Jet Boat Tours operate out of Niagara-on-the-Lake, a short drive from Niagara Falls, and take visitors on thrilling jet boat rides through class 5 whitewater rapids. Tours are in open boats during the summer and dome covered boats in the spring and fall. Visitors should prepare to get wet! Tours are also educational, offering information on the geology and history of the area. MarineLand is one of Southern Ontario's biggest summertime family attractions. The facility is both a full scale amusement park with all kinds of rides and games, and an impressive marine park with shows featuring whales and dolphins. Located in Niagara Falls, Marineland is also a popular day trip from Toronto and the surrounding area. Niagara-on-the-Lake is a quaint little town on the shores of Lake Ontario just a 20-minute drive from Niagara Falls along the Niagara Parkway. The town has a strong mid 19th-century appearance owing largely to its history. 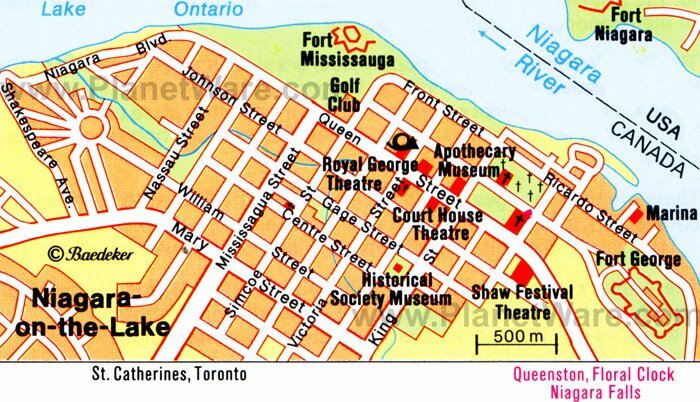 During the war of 1812, part of the town was razed and as a result, much of the original architecture was built in the years following the war. Building by-laws have since ensured that newer architecture is built in similar style, resulting in this charming town where horse-drawn carriages pulling tourists through the streets blend beautifully with the old-style buildings. Some tours of Niagara Falls, particularly those from Toronto, include stops in Niagara-on-the-Lake, where visitors can wander through the shops or enjoy a meal. The area is particularly lovely in fall with the changing color of the leaves. Luxury Hotels: Offering spectacular views of the Horseshoe Falls, the Marriott Fallsview Hotel & Spa has well-appointed rooms and a highly regarded steakhouse. The Sheraton on the Falls also offers amazing views and, with an indoor waterpark, is a very good option for families. This hotel lies in the heart of the attractions of Clifton Hills and within walking distance to the falls themselves. The well positioned Hilton Niagara Falls is a large property with falls-view rooms and suites, and the WEGO shuttle to local attractions stops right in front of the hotel. Mid-Range Hotels: The Radisson Hotel & Suites offers oversized rooms and suites with views of the falls through large windows, as well as two restaurants and an indoor pool. A 10-minute walk from Clifton Hill and 20 minutes from the falls is the recently renovated and centrally located Courtyard Niagara Falls. This hotel has both an indoor and outdoor pool. Two blocks from the falls, the DoubleTree Fallsview Resort & Spa by Hilton features an indoor saltwater pool, rooms with mini refrigerators, and some rooms looking out to the American Falls. Budget Hotels: A five-minute drive to Clifton Hill and the falls is the The Rex Motel, a small property with themed rooms at a budget rate. 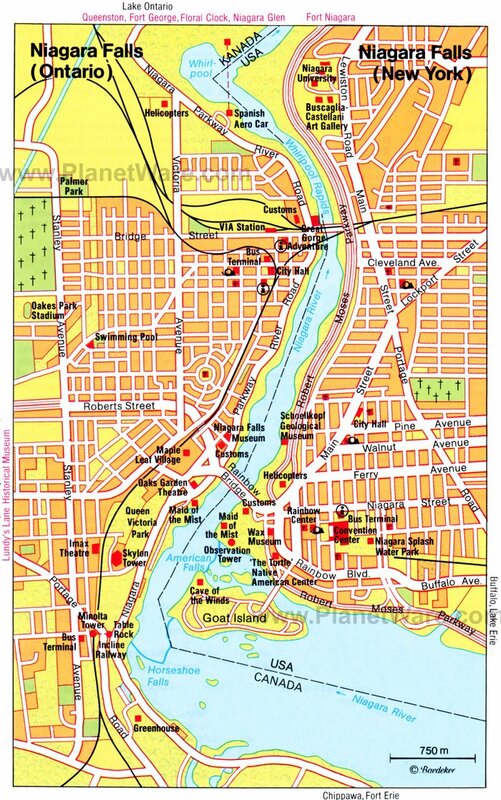 The Country Inn & Suites is a short walk from Clifton Hill and a longer walk to the falls. This hotel features standard rooms, suites with separate living areas, an indoor pool, and a complimentary hot buffet breakfast. A 10-minute drive from Niagara Falls, but ideally situated close to Marineland, is the Niagara Parkway Court, with clean and comfortable rooms. 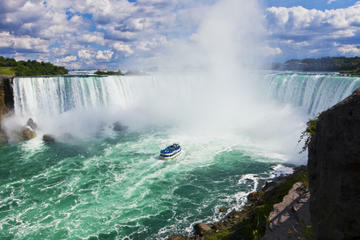 Sightseeing Tours: If you only have half a day to sightsee, the Best of Niagara Falls Tour from Niagara Falls, Ontario is a convenient and great-value option, with pickup and drop-off at your hotel. This five-hour tour includes a professional guide as well as admission to the Skylon Tower, Hornblower cruise, and Journey Behind the Falls, so you can see the falls from a variety of angles. To ensure a more personalized experience, the tour is limited to six people. 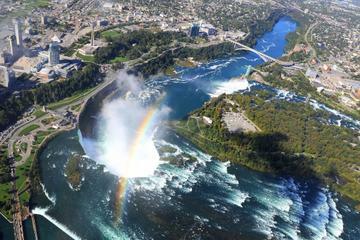 Fly over the Falls: For a bird's eye view of the falls, consider the Niagara Falls Grand Helicopter Tour. Hover over this thundering natural wonder on a 20-minute scenic helicopter flight, while the experienced pilot shares fascinating information about the falls and nearby historic landmarks. A minimum of two people are required for this tour.